Definition at line 141 of file lldrawpool.h. Definition at line 144 of file lldrawpool.h. Definition at line 146 of file lldrawpool.h. Definition at line 161 of file lldrawpool.cpp. Definition at line 167 of file lldrawpool.cpp. Definition at line 331 of file lldrawpool.cpp. Definition at line 373 of file lldrawpool.cpp. References LLFace::getReferenceIndex(), mReferences, and LLFace::setReferenceIndex(). Definition at line 172 of file lldrawpool.cpp. References llendl, llinfos, and mReferences. Definition at line 180 of file lldrawpool.cpp. Definition at line 224 of file lldrawpool.cpp. Referenced by LLDrawPoolTerrain::renderFull2TU(), LLDrawPoolTerrain::renderFull4TU(), LLDrawPoolTerrain::renderFull4TUShader(), and LLDrawPoolTerrain::renderSimple(). Definition at line 190 of file lldrawpool.cpp. 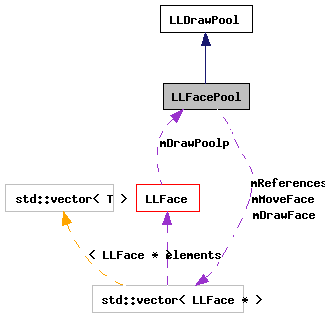 Definition at line 207 of file lldrawpool.cpp. Definition at line 325 of file lldrawpool.cpp. Reimplemented in LLDrawPoolTerrain, and LLDrawPoolTree. Definition at line 353 of file lldrawpool.cpp. Definition at line 156 of file lldrawpool.h. Definition at line 189 of file lldrawpool.h. Definition at line 184 of file lldrawpool.cpp. Definition at line 405 of file lldrawpool.cpp. References LLDrawPool::getType(), llendl, and llinfos. Definition at line 338 of file lldrawpool.cpp. References mDrawFace, removeFaceReference(), TRUE, and vector_replace_with_last(). Definition at line 358 of file lldrawpool.cpp. References LLFace::getReferenceIndex(), mReferences, S32, and LLFace::setReferenceIndex(). Definition at line 232 of file lldrawpool.cpp. Implemented in LLDrawPoolAvatar, LLDrawPoolGround, LLDrawPoolSky, LLDrawPoolStars, LLDrawPoolTerrain, LLDrawPoolTree, and LLDrawPoolWater. Definition at line 239 of file lldrawpool.cpp. References b, f, face, g, glBegin, glColor4f, glEnd, glPopMatrix, glTranslatef, j, mDrawFace, LLVector3::mV, p, r, S32, and table. Definition at line 348 of file lldrawpool.cpp. Definition at line 382 of file lldrawpool.cpp. References FALSE, llendl, llinfos, mDrawFace, and TRUE. Definition at line 191 of file lldrawpool.h. Definition at line 192 of file lldrawpool.h. Definition at line 194 of file lldrawpool.h. Referenced by drawLoop(), enqueue(), removeFace(), LLDrawPoolWater::render(), LLDrawPoolTree::render(), LLDrawPoolTerrain::render(), LLDrawPoolStars::render(), LLDrawPoolSky::render(), LLDrawPoolGround::render(), LLDrawPoolAvatar::renderAvatars(), LLDrawPoolTree::renderForSelect(), LLDrawPoolTerrain::renderForSelect(), LLDrawPoolAvatar::renderForSelect(), LLDrawPoolTerrain::renderFull2TU(), LLDrawPoolTerrain::renderFull4TU(), LLDrawPoolTerrain::renderFull4TUShader(), LLDrawPoolTerrain::renderOwnership(), LLDrawPoolWater::renderShaderSimple(), LLDrawPoolTerrain::renderSimple(), LLDrawPoolSky::renderSkyCubeFace(), LLDrawPoolTree::renderTree(), renderVisibility(), resetDrawOrders(), LLDrawPoolWater::shade(), and verify(). Definition at line 195 of file lldrawpool.h. Definition at line 196 of file lldrawpool.h. Referenced by addFaceReference(), destroy(), LLDrawPoolTerrain::dirtyTextures(), LLDrawPoolAvatar::getDebugTexture(), isDead(), LLFace::printDebugInfo(), removeFaceReference(), and LLSurface::~LLSurface().